If you are looking for information on the Crown Trophy franchise business opportunity, Crown Trophy franchises or Crown Trophy franchising, then you have come to the right place. Crown Trophy can offer you an opportunity to be part of the most successful and fastest growing sports related franchise in America. 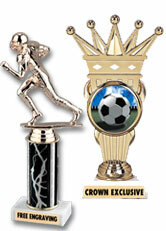 Crown Trophy is the only franchise of its kind and is truly a unique concept with an exciting and unlimited future. If you like the sports environment, and enjoy developing business and community relationships, this is a franchise you should seriously consider. Crown has Over 125 Success Stories, driven by our ability to help you choose the best area for your new business. The site selection process has many important steps, and Crown will assist you in all of them. Together we will find a prime location, walk you through the lease negotiations, and provide the actual design and layout of your store. Crown expertise and years of experience will give you the best opportunity to succeed. The awards and recognition industry has developed into a Multi-Billion Dollar Market, and it is still growing. Crown realized the potential of this market and has built itself into the industry's most powerful retailer. The number of organized leagues catering to both boys and girls sports continues to grow, and smart businesses reward employees for achievement, creating the need for more awards. While the industry continues to expand, the number of outlets servicing the industry continues to decline. Crown Trophy, the largest retailer of trophies in America, has a clear vision of the future of the industry, and sees a bright outlook for its franchise owners in the years ahead. 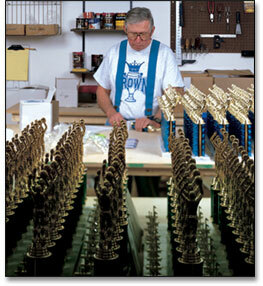 With low start-up costs and tremendous potential, the Crown Trophy system offers great opportunity for success. 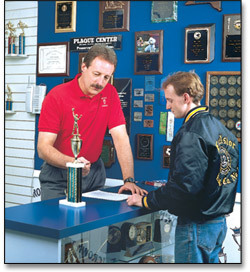 Crown Trophy is the only franchise system in the entire industry, and has developed over 125 stores nationwide. Crown Trophy's president, Chuck Weisenfeld states "The awards industry is filled with small shops that sell awards as an afterthought, and the industry is in dire need of professionally run award centers." Crown has positioned itself as the leader for the next millennium. Crown will continue to grow and dominate the industry, by bringing more cost efficiencies through its mass purchasing, state-of-the-art product development, and by increasing name identity throughout America. Simply put, we feel we are at the right place, at the right time, in the right industry. The years ahead should prove to be a period of tremendous growth for each franchise location, and in turn for the entire Crown Trophy franchise system. Many people underestimate the power of the awards industry, and the broad scope of the people it touches. Organized sports have grown tremendously, but sports awards just scratch the surface. 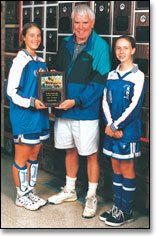 Consider the multitude of trophies, awarded by clubs, tournaments, and other special events. The millions of diplomas laminated every year. The scores of businesses that present corporate awards every month, quarter, and year. At Crown Trophy "Everyone is a Winner." We create very special cost-efficient awards, enabling organizations to recognize all their participants. Our "Awards for Everyone" concept is an important element in the growth of every child, student, and employee. Lower costs and higher-profit margins are the key to any franchise system. 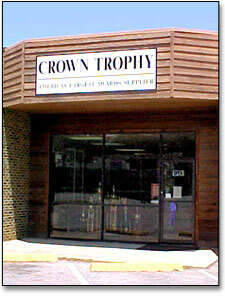 Crown's mass purchasing power gives trophy centers under the Crown umbrella a huge financial edge. As we add stores, our ability to help individual owners becomes greater. The Awards Industry is a Proven Business. Even in a struggling economy, people always need recognition, whether it's rewarding a key employee, acknowledging an achieving student, or honoring a gifted athlete. You'll be your own boss; you'll make your own hours. You'll be self-sufficient and you'll thrive in a community-minded business, where you'll be dealing with the decision makers of schools, leagues, and businesses. We hope you take the time to investigate our franchise opportunity. We truly feel we have a fun family franchise which offers great financial opportunity.